Fourteen new, beautiful Forever® postage stamps are available for you from the US Postal Service for the 2016 Holiday Season. They creatively depict the major holidays and winter wonderland we can enjoy in our wonderful diverse culture. Take a look at this assortment of scenes of nature and festivals! 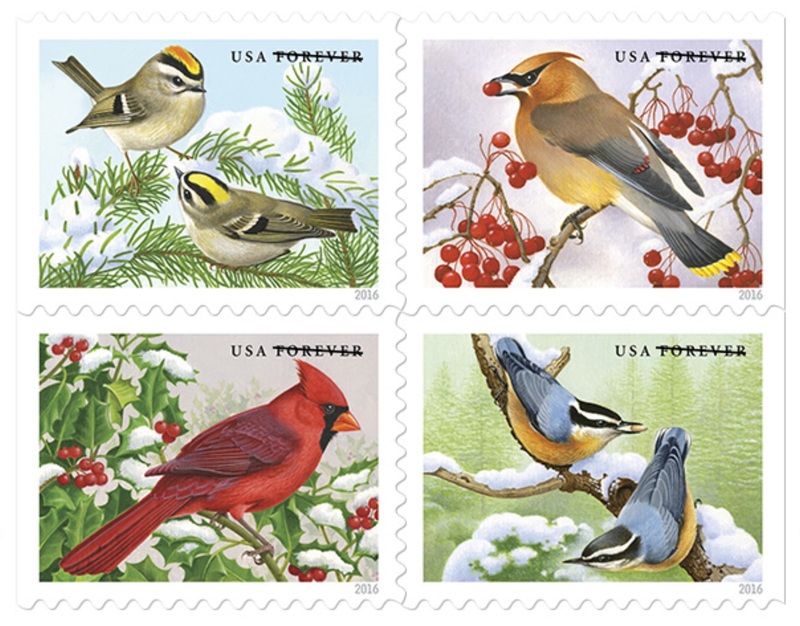 Group 2 is a set of 4 stamps: "Songbirds in Snow"
United States Postal Service®, © United States Postal Service. As my wife and I apply postage to the addressed envelopes for our Christmas cards and letters, we have fun remembering each person and the good times we had together. This is one of the ways we stay connected with family and friends, and send them our love. Usually they reply with an update on the events, comedies, and challenges in their lives as well. For some, we eMail our Christmas greetings. The USPS stamps help us to get into the joyful Christmas spirit. Also, we listen to some seasonal music and drink hot chocolate or apple cider ... happy moments. 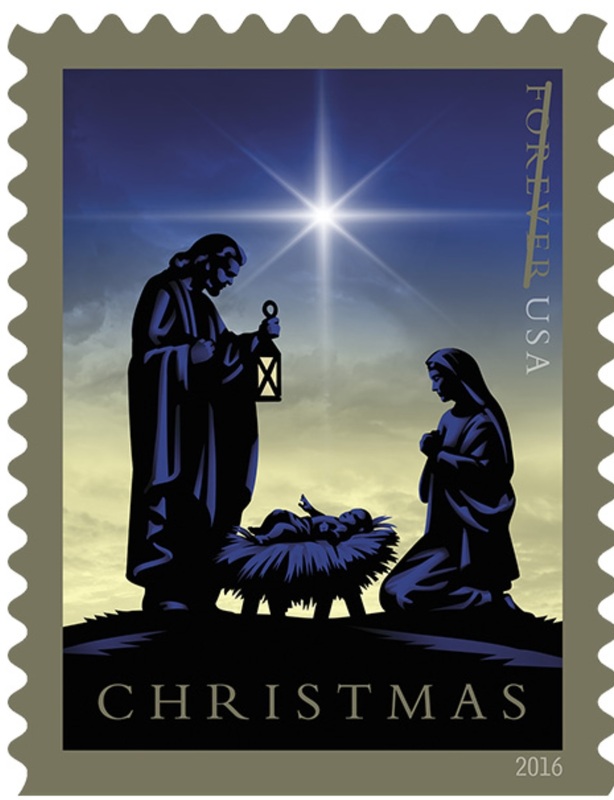 The latest Christmas stamp design is the “Nativity” depicting Mary, Joseph, and the baby Jesus (in a straw-filled manger) silhouetted in purple against a quiet dawn sky. Joseph holds a lantern, while the bright star of Bethlehem illuminates the sky. 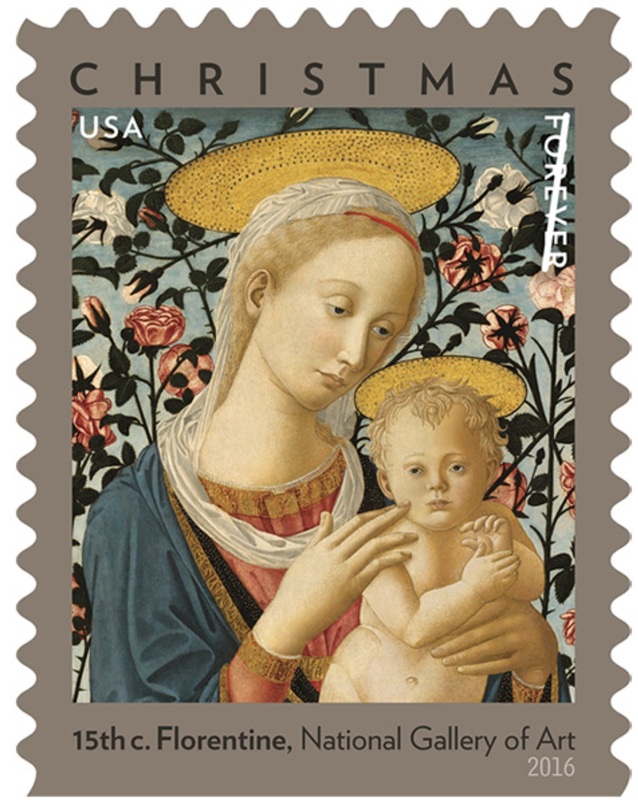 A contemporary US artist designed this stamp which continues the colorful “Holy Family” and “Christmas Magi” stamp-series issued in previous years. The traditional art issue for 2016 is: “The Florentine Madonna and Child” –from a 1470 Italian Renaissance painting of Mary and her young child, Jesus, with soft pink and white roses in the background. This stamp continues years of USPS’ presentation of masterpieces from past centuries which can speak deeply to one’s faith. 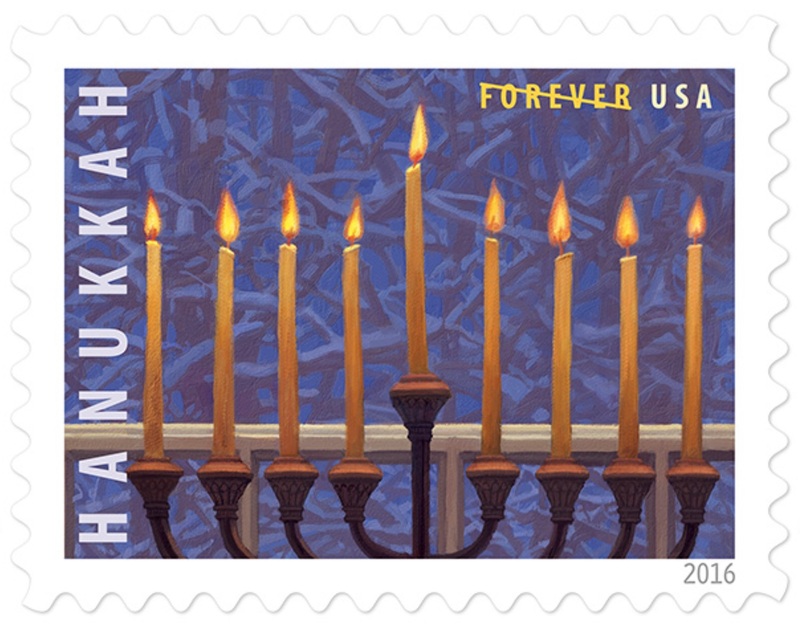 2016 "The Florentine Madonna and Child"
For our friends of the Jewish tradition, a new, stunning “Hanukkah” stamp features an elegant Menorah in the window of a home. Its nine lighted candles are a creamy white. The window trim, visible between the candles, reveals the snow-covered tree branches beyond the glass. Hanukkah means "Dedication" and is customarily celebrated in December. 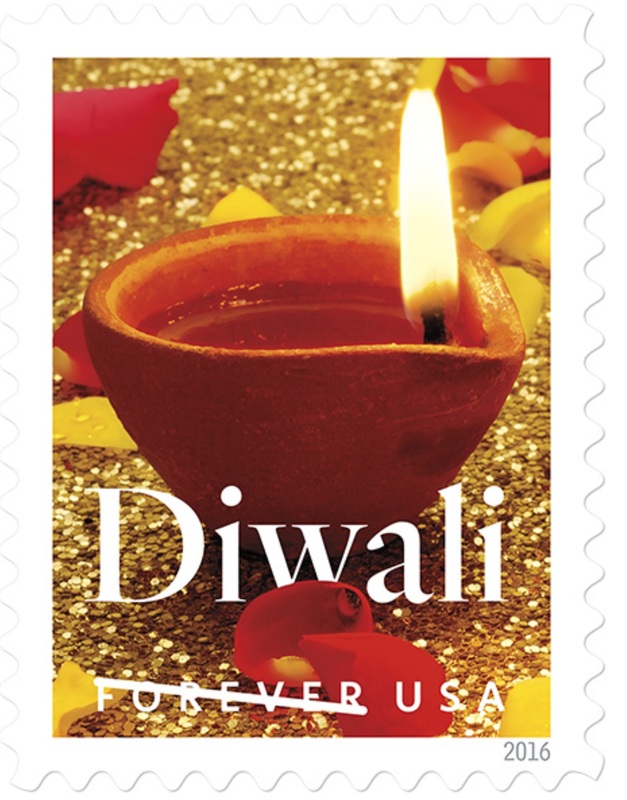 The new, impressive “Diwali” stamp displays an oil lamp on a golden background commemorating a joyous festival. One of the important annual Hindu, Sikhs, Jains, and Buddhists events, this holiday celebrates the triumph of good over evil. 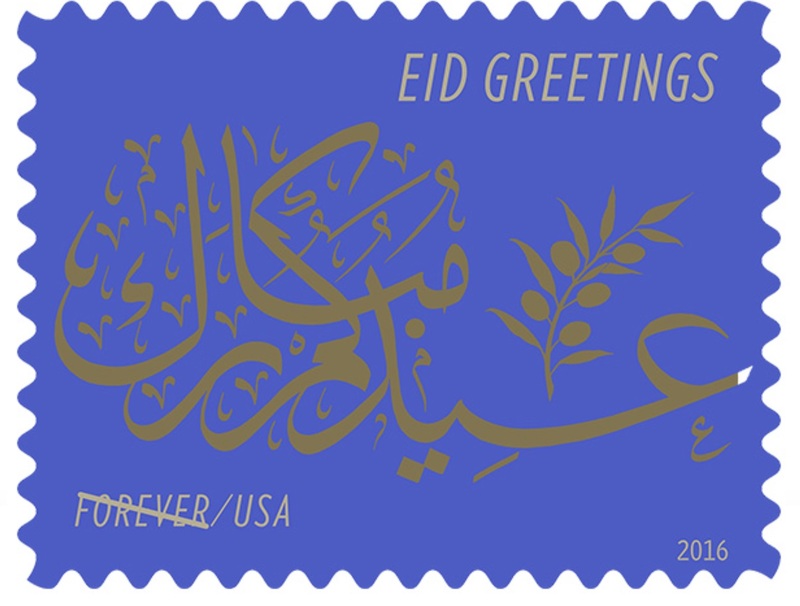 The 2016 version of the “EID Greetings” evokes centuries of tradition featuring unique gold calligraphy and an olive branch. It commemorates the two most important festivals, or Eids, in the Islamic calendar. 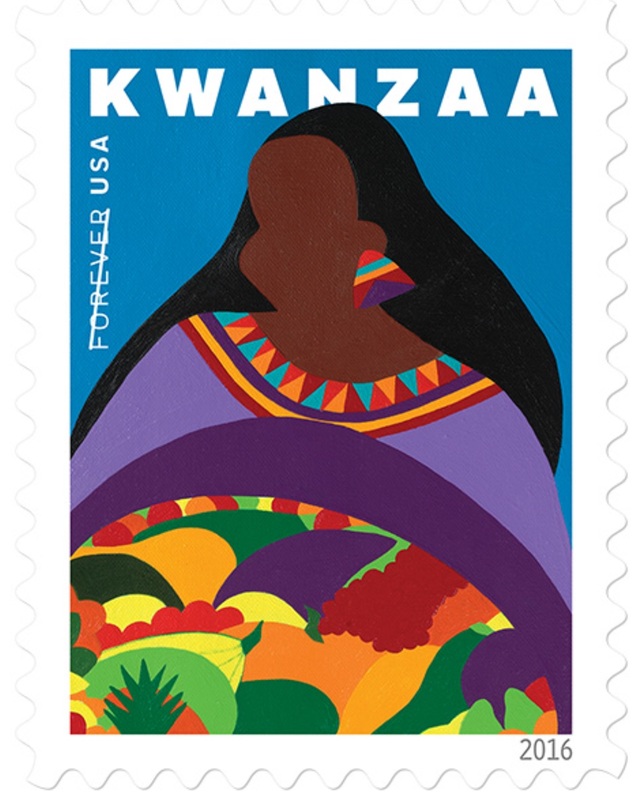 An updated 2016 “Kwanzaa” stamp celebrates the 50th anniversary of this annual, non-religious event observed by many African-Americans which brings together family, community, and culture. 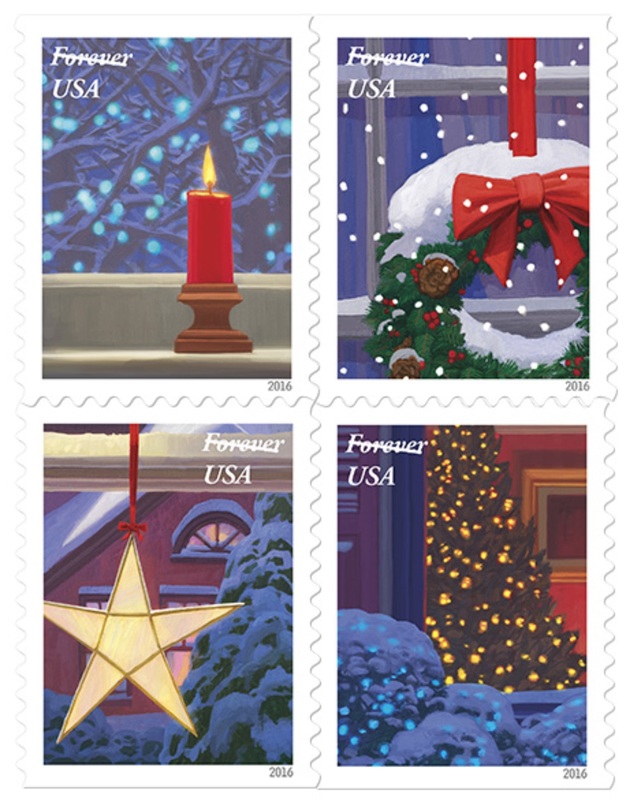 A new secular issue set, the attractive “Holiday Windows” contains four stamps. Featuring snowy winter nights, these stamps recall the peaceful times of childhood and the role windows play–letting us delight in the snow when we are inside while sharing our warmth and merriment with the outside world. Look for some around you. All fourteen stamps help us remember and share the sights, sounds, smells, tastes, thoughts, and feelings of our holidays and our scenic Winter Wonderland. Some of this commentary is taken from the stamp descriptions at www.USPS.com which can provide you with phone and internet ordering information. Browse their web site to learn more and to enlarge each stamp image so you can appreciate their design and beauty. In these modern-times you can access the stamps from your smartphone, home computer, iPad, or the computers at your Library. Local post offices may not carry all issues. By the way, USPS is planning a small price increase starting January 22, 2017; you may save money by purchasing these Forever® stamps before that date. Go to the author’s web site: www.KenKozy.com and click the “eBook Stamps” tab to access more information. While at that web page, you may click links to be entertained with related music, videos, 3-D tours, photos, and references and to read other free eBooks featuring multi-dimensional internet links. Surprise yourself with a Winter Wonderland experience in 7 Dimensional eCommunications! "A Winter Wonderland in Stamps"
The following are MULTI - DIMENSIONAL LINKS to see and hear interesting Music Videos, 3-D Tours, Photos, and References. CLICK >>> LINKS below to go to internet sites for a 7-Dimensional eCommunications experience! Traditional Christmas carol: “O Little Town of Bethlehem” with lyrics and beautiful scenes by United Studio Orchestra, Children's Chorus and The Mormon Tabernacle Choir. Link to YouTube. Pop Modern: “Carola” sings a beautiful rendition of "Find My Way To Bethlehem" with orchestra. She is Carola Maria Häggkvist an excellent Swedish singer and POP songwriter. Link to YouTube. Popular Hebrew Song: Shalom Aleichem with English translation ("Peace be upon you") is a traditional song sung by religious Jews every Friday night upon returning home from synagogue prayer. Beautifully presented by Susana Allen & Hector David.Link to YouTube. Tour with 3-D effects of the Stable Cave of the Nativity. Beautiful panoramic photos of the birth place of Jesus in Bethlehem. Best on larger screen. You can move in 360 degrees circle or horizontal or vertical with mouse. See some of the original rocks as well as altars, candles, ceiling, and art work. Study scenes as much and as long as you want. No narration, only informative text (click !) and animated pictures (click >). Be patient - it is challenging at start, but well worth the time. New American Bible – Revised Edition with options for commentary and notes of Nativity in Bethlehem. (Luke and Matthew Gospels). King James Version (KJV) with options for audio reading of text of the Nativity in Bethlehem. (Luke and Matthew Gospels). The website, www.KenKozy.com, contains no ads. The web pages, articles, eBooks, and links are for personal education, non-profit, and “fair use” only, and are not to be used for monetary profit; Ken Kozy's written material and photos are made available free of charge. All copyrights are the property of the respective owners of: text, graphics, art works, maps, references, Bibles, articles, tours, and commentary, as well as of electronic information, images, photos, music, videos, dramatizations, audio readings, performances, and movies and all material at Linked sites included therein. * For all stamp images Credit Source is: United States Postal Service®, © United States Postal Service. All rights reserved.